We are excited to welcome thought leader Dr. Stephen Tedeschi as a guest blogger. Dr. Tedeschi, is a Partner at PatentVantage, a leading patent research and strategy firm. He is also an Adjunct Faculty member at the National Institute of Health’s Foundation for Advanced Education in the Sciences (FAES). For more on Dr. Tedeschi, please see below. In every stage of innovation, knowledge of current and previous research is critical to developing a clear direction to progress forward. From inception, to basic research, to development, to sales, to product protection, reviewing both patent and technical literature published globally will greatly influence your ability to make technical, legal, and business decisions. It is particularly important at the beginning of the innovation lifecycle, when scientists and engineers are planning a research project. Missing critical prior research can result in repeating others’ research, including unsuccessful projects, not knowing solutions to common challenges already encountered, and losing ownership of any products or licenses resulting from the research already patented. All too often, I’ve seen scenarios where the missing information was readily available in a patent. Here are just a few examples. In one scenario, I was working with, unquestionably, one of the top scientists in a technology and who had just developed a cutting edge invention. His team was comprised of experts in the technology, they knew all of their competitors, and kept track of what they were doing. They were positive that no one had invented something similar to what they had described in their patent application. They were exceptionally confident about their competitive knowledge, and had never seen this particular technology published in any of the journal articles they uncovered. Their attorney requested a quick patentability search purely for sake of due diligence. Sure enough, within the first few search steps, I found the exact invention disclosed in a granted patent. The lead scientist was shocked. Not only were they unable to patent the invention, it was clear that they had also wasted years of research time and funding on something that was already invented. They could not produce anything without licensing the technology from the first inventor. The team was forced to go back to the drawing board and start over. In another scenario, an existing patent may not cover the entire new invention. I’ve seen inventions that were only partially disclosed in previously published patents, however, if it’s a critical portion without which the invention does not work, a researcher would again be forced to license the technology from the first inventor – or develop a workaround for that portion of the invention. In both of these scenarios, had the researcher known about the existing patent data, it would have fundamentally changed the course of their research and would have likely prevented these surprises, loss of time, and saved massive amounts of funding for further research. A third scenario hits a little close to home. It’s a mistake I’ve made personally even with the best intentions. When preparing for my graduate research, I conducted what I felt was an extensive literature search. I even searched the United States Patent and Trademark Office’s USPTO Patent Full-Text and Image Database (PatFT) and European Patent Office’s (EPO) ESpacenet, a few of the only ways to access patent data at the time. I found a few articles and one patent related to my work but nothing that gave me any significant direction. After 8 months of struggling to produce even a small amount of a metal high aspect ratio powder, material critical to conduct my research, I attended a conference where I met a company that produced a very similar powder in such large quantities that they gave me enough for my research for free! Once I knew about the company, I went back to PatFT and was able to find a dozen or so patents that explained the solution to many of the same issues I was encountering. I’ll explain how I missed them shortly. It was this firsthand experience that helped me develop a passion for understanding patents. These are just a few examples of information missed by not searching patents. For other examples of why patent searching is important to researchers, you can also read previous posts by Richard Resnick and Henk Heus. The amount of time and funding wasted varies, but in all of these cases, effectively searching patent data would have provided data critical to determining how to better proceed with research. As researchers, scientists and engineers, we have been taught early on in our careers to scour journals for articles to develop an understanding of what research has already been completed. Universities and research centers have excellent access to a wide variety of journals that provide a significant portion of this information and as researchers we are well versed in searching them. As such, every project begins with a thorough search of academic journals and a literature survey of sorts to outline the technology landscape. We develop an intimate knowledge of other top researchers and their work. This is especially common in academia, where we know the important publishers in our technology and (often personally) know the top authors. We even attend many of the same conferences and frequently sit on the same panel. We are also eager to publish our work in journals and measure our success in part by watching the number of citations increase. Researchers in industry are generally not publishing in journal articles often due to time and financial restrictions. The general strategies I’ve witnessed personally focus on applying for patents to protect products resulting from the inventions. Historically, patent data has been an overlooked source of information that is absolutely crucial to fully understanding the state-of-the-art. Therefore, there is a vast amount of information that is not even being considered early in the innovation lifecycle. It’s only when considering applying for a patent that patent data is investigated and by that point it’s too late. Until relatively recently, patents were harder to access. Although patent offices such as the USPTO and EPO offer free access to data, the ability to precisely dig through it is limited. Only simple search queries can be used and filtering the results through these portals can be difficult to say the least. To complicate things further, patents are legal documents and are often intentionally written in non-obvious ways. Many legal terms are used and authors are allowed to be their own lexicographer by developing new definitions for terms in the specification, resulting in new interpretations of the invention disclosure. As I found out while doing my own research, it becomes quite difficult to find all of the patents and applications related to a specific technology. As highlighted in the last scenario above, a high quality patent search requires more effort than just entering a few queries into a Patent Office search page. It requires an understanding of the various ways patents are written, how they are organized, and how to access them effectively and efficiently. This is a very detailed discussion and will have wait for a future post. 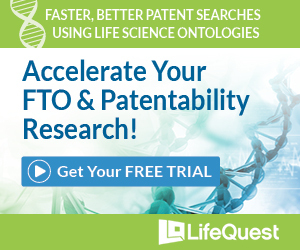 Ready to search patents like professionals do? It’s easier than you think! Start now your Free Trial access the GQ Life Sciences Suite and you’ll even have access to experts from the GQ Life Sciences team to help you along.